I’d no idea the moon would begin to turn a blood red at one edge with the most beautiful graduation of colours across its disc. As this eclipse progressed, the moon went through a series of fantastic variations of colours and eventually transformed itself into a dark brooding opal that seemed to last for ages before disappearing in a fainter reversal of the whole progression. It was November and a very cold frosty night in the Scottish Borders. I couldn’t leave the hillside while this was going on. It seemed to last half the night although I’m sure it didn’t. I’ve rarely felt so cold to the very core. Small wonder our ancestors felt this event had a special significance. 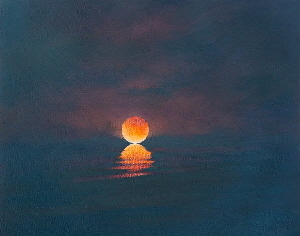 I’ve seen many lunar eclipses since then but this painting is simply a minor variation on that first experience.